The Jeep has been around for some time. Developed initially as a very light truck for general purpose (GP... "Jeep") use during the second world war, it eventually caught on in the civil market, growing through many variations to become its own brand name and family under the Daimler-Chrysler banner today. It seems somehow appropriate that this tough little vehicle is available as a metal body kit. The heavy, durable feel of the kit lends itself well to this subject. The kit comes in silver, prepainted red metal, and black plastic. As usual, this is a simple kit to put together. 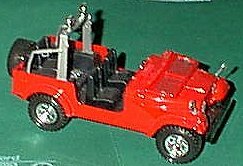 No tools other than a small phillips screwdriver are needed.. As this represents an "open top" Jeep, there are fewer moving parts than usual - and in this case, the steering is not operational. To make up for the lack of doors, the windscreen folds down. You don't have to do anything for this, however, as it's already built in with the metal body. There's nothing really outstanding to say about the kit. All parts fit together very well, with a minimum of fuss or bother. The kit itself is almost devoid of detail - there's nothing inside (you'll have to drybrush to bring out some of the molded in detail,) there's no engine compartment at all, and the underside gives a simplistic representation of both the transmission and the exhaust - moreso than usual. 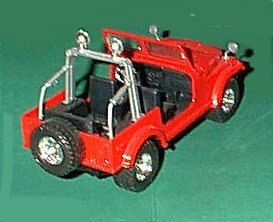 A "spare tire" is provided for the back, and a shovel and axe are represented in silver plastic for the back seat. These are not highly detailed, however, and could be replaced. This kit as stated goes together very simply - simply enough that I can't help but consider the final product an overgrown "Hot wheels" car, or one of those metal Tonka trucks. I'm sure some enterprising scratchbuilder could make up for some of the lacking details, even improving on the underside, but at the $14 paid for this, it's too expensive by half for what you get. Still, it's not a challenging build, by any means, and ends up being very durable - durable enough to give to the kids to play with in the sandbox, in the mud, wherever, without gumming up any delicate works. They may even enjoy the time spent building it - however few those minutes may be.